The Downtown Farmers’ Market, presented by UnityPoint Health – Des Moines, connects urban and rural communities while supporting nearly 300 local entrepreneurs, including farmers, producers, bakers and artists that represent 50 counties across the state of Iowa. Des Moines’ Downtown Farmers’ Market is produced by the Greater Des Moines Partnership. The Downtown Farmers’ Market began in 1976 with just 15 vendors and an average of 200 shoppers and operated July through September. Today, The Market supports nearly 300 vendors and an average of 25,000 visitors each Saturday during May through October and over 100 at the Winter Market in November and December. 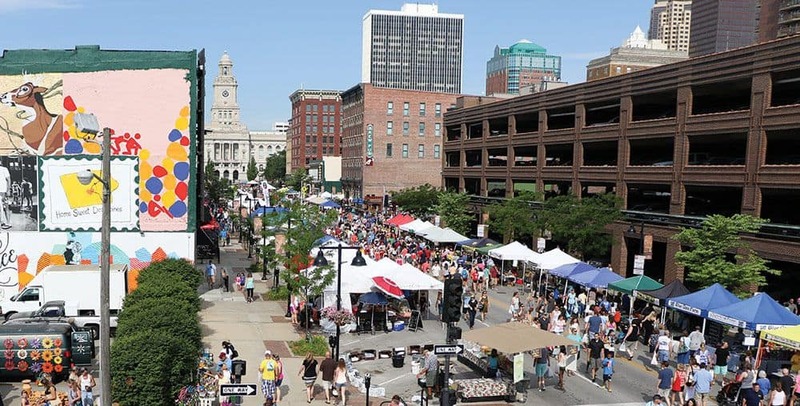 Located in Downtown Des Moines’ (DSM's) social area in the Historic Court District, the Downtown Farmers’ Market is easy to spot once you’re in the city. If the market-goers strolling toward the center of the activity don’t tip you off, then the Polk County Courthouse will. Find your way to the Courthouse at 500 Mulberry St. and you’ve found The Market. The Market spans nine city blocks in Downtown DSM: On Court Avenue from Water Street to Fifth Avenue and extending north and south on Second Avenue, Third Street and Fourth Street. While The Market plans to be open every Saturday May through October, rain or shine, inclement weather can make closures, delays and/or cancellations possible. In the case of emergency weather conditions, the safety of Market patrons and vendors (and their employees) is The Market’s first priority. Because of the variable nature of a potential emergency or urgent situation, vendors, patrons and the general public should be on alert and adhere to the direction given in the emergency or urgent situation. If time permits, information about closures, delays or cancellations will be broadcast. The Market social media outlets will also have information in addition to this website. The Market has been nationally recognized by families and critics alike. Whether they’re praising the farm-fresh produce at the Saturday Market or the delicious spices that fill the air at the Downtown Winter Farmers’ Market, people across the country call The Market one of the America’s best. The Downtown Farmers’ Market was ranked #2 of the 101 Best Farmers' Markets in America by The Daily Meal for two consecutive years, 2013 and 2014. The Market has also been named #2 of the Top 10 Farmers Markets in the U.S. by Shape Magazine. The Market has been ranked one of America’s Best Farmers’ Markets by Midwest Living Magazine. The Market has been ranked Best in the Midwest by Country Living Magazine, featured in a blog on RachelRay.com and mentioned by the Associated Press in 5 Free Things to Do in Des Moines, Iowa’s Up-And-Coming Capital. The Market has been named a Top 25 Farmers’ Market in America by Parade. Purchase a commemorative shopping bag made from jute fibers along with a stylishly designed tumbler at The Market Information Booth located near the northeast corner of Third Street and Court Avenue during the Summer Market or at the Information Booth on the main floor of Capital Square (near the bottom of the escalator) during the Winter Market. The bag is perfect for toting all of your Market purchases! A 20-oz. tumbler with colorful Downtown Farmers’ Market design keeps liquids cold for up to 24 hours and warm for up to 12 hours. Gift certificates are also available and can be purchased in advance (not available for sale during Market hours). For more information or to order merchandise and gift certificates, please email Kelly Foss.